The previous day’s double feature, coupled with the lengthy and hectic travel to get to New Jersey, left us pretty tired. But, we were now on the home stretch and nothing would get in the way of our completing this tour! Fortunately, the next screening at Brookdale Community College was extremely well organized. Linda Wang and her students in the Brookdale Asia Society were very proactive in getting the word out to students and the outside community. We also got great publicity from the World Journal and from my uncle’s friends and colleagues. As a result of their efforts, we saw a large crowd of about 120-130 people at the screening. Asia Society even brought a popcorn maker, which brought an authentic movie viewing experience to the evening! The night kicked off with an overview of Chinese history during the time of Qiu Jin by Michelle, a member of Brookdale Asia Society. This helped set the stage for our film, which was shown on dual projector screens in the room. 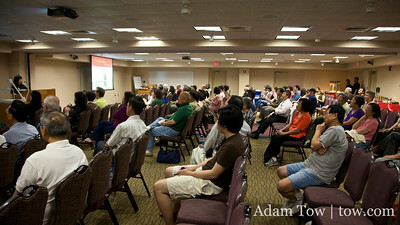 The majority of the audience was older Chinese Americans like at our GBCCA screening. When I asked how many of them knew about Qiu Jin growing up, all but a few raised their hands. Even still, they learned some new things after watching the film, such as her extensive work in the Chinese women’s movement. One audience member asked why Chinese parents didn’t mention Qiu Jin to their American-born children. A woman offered up her own experience of telling her kids about more recent historical events, such as the atrocities that occurred in Nanking during World War II. She felt that it was the responsibility of Chinese parents to pass down the stories of their culture to the next generation, and said she would contribute by showing Autumn Gem to her kids. On that note, many in the audience also purchased our DVDs. Thank you! We hit an all-time one day sales record that night! Here are photos from our Brookdale Community College screening.